Most Rev. Leo A. Pursley, D.D. On a hot May day in 1917, three little shepherds were watching their sheep in a hollow in the mountains of Portugal called Cova da Iria. The sky above them was a clear blue. Not the smallest cloud could be seen anywhere. The sun beat straight down, for it was noon. Then a familiar sound was heard. The bell in the village church was ringing for the Angelus. 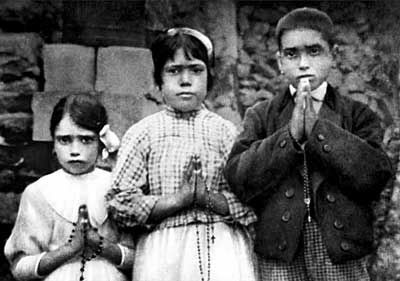 Lucia Santos (age 10, pictured in the middle) and her two cousins: Francisco (age 9) and Jacinta Marto (age 7) holding their rosaries. 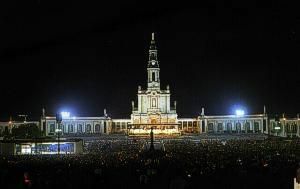 Fatima, Portugal 1917 A.D. 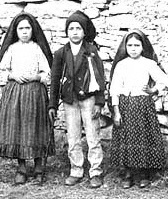 The three children: Jacinta, a girl of seven; Francisco, her brother, a lad of nine; and Lucia, a girl of ten, at once knelt and began to say the rosary together. Suddenly, there was a great flash of light, brighter than lightning. The children looked up and all around them. “Might be a big storm coming. Let’s get the sheep together and go home,” said Francisco. The girls agreed, and soon they and the sheep were scampering down the slope towards home. When they reached the foot of the hill they saw a second great flash. It was brighter than the first. They stopped; very much afraid. “Look!” said Lucia, pointing toward a little oak tree. Then the shepherds drew near. 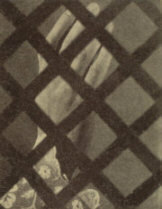 They noticed the lovely lady had her hands joined as in prayer, and a pearl rosary fell from her fingers. “Where did you come from?” Asked Lucia. Lucia then asked the lady if they would go to heaven. They were happy when she told them they would. “Children, always say the rosary with devotion.” said the lady, and then she left them. “We must not tell anyone about the lady. No one will believe us.” Said Lucia. To this the others agreed. Then they got their sheep together and went home, even though it was much too early. "Certain fashions will be introduced that will offend Our Divine Lord very much." But Jacinta thought her mother would punish her for coming home, so she told about the lady! “You are lying to me!” Shouted the mother. Mrs. Marto, Jacinta’s mother, ran at once to Lucia’s home and reported all the children had told her. Lucia had not said a word to her mother, who seemed stunned at the story. “Don’t you say another word about this, Lucia,” said her mother as she ran out the door. Lucia’s mother, Maria, hurried to the pastor and told him the story. He tried to calm her, but the woman insisted her daughter was lying to her. She then hurried home and gave Lucia a sound thrashing. But that did not change Lucia’s mind. Penances to Help Save Poor Souls from going to Hell. June 13 was a fair day, but the children did not care about that. It was the day the lady promised to come to see them again, and so they went to the appointed spot. There were about sixty other people waiting. The children knelt down and began to say the rosary. When it was finished, they stood and brushed the dust from their clothes.”The lady is coming!” cried Lucia and ran down the hill to the little oak. The others followed. Yes, it was the lady. She was dressed just the same, and she seemed pleased to see them. “What do you want me to do?” begged Lucia. Lucia Santos became a Carmelite nun and devoted her entire life to spreading Devotion to the Immaculate Heart of Mary, as Our Lady of Fatima requested. “I want to ask you to take us to heaven,” said Lucia pleadingly. On July 13, the children were again waiting for the lady. This time there were about five thousand others waiting too. The lady told the children that she would work a great miracle in October so that all would believe she had appeared there. She also showed them a *vision of hell, and it was so terrible that the children said they would have died of fear if the lady had not told them they were to go to heaven. Our Lady told the Children, "Sacrifice yourselves for sinners and say many times, especially when you make some sacrifice: `O Jesus, it is for Thy love, for the conversion of sinners and in reparation for sins committed against the Immaculate Heart of Mary." “She opened Her hands once more, as She had done the two previous months. The rays [of light] appeared to penetrate the earth, and we saw, as it were, a vast sea of fire. Plunged in this fire, we saw the demons and the souls [of the damned]. The latter were like transparent burning embers, all blackened or burnished bronze, having human forms. They were floating about in that conflagration, now raised into the air by the flames which issued from within themselves, together with great clouds of smoke. Now they fell back on every side like sparks in huge fires, without weight or equilibrium, amid shrieks and groans of pain and despair, which horrified us and made us tremble with fright (it must have been this sight which caused me to cry out, as people say they heard me). The demons were distinguished [from the souls of the damned] by their terrifying and repellent likeness to frightful and unknown animals, black and transparent like burning coals. That vision only lasted for a moment, thanks to our good Heavenly Mother, Who at the first apparition had promised to take us to Heaven. Without that, I think that we would have died of terror and fear." "You see Hell, where the souls of poor sinners go. To save them God wishes to establish in the world the devotion to my Immaculate Heart. If they do what I will tell you, many souls will be saved, and there will be peace... But if they do not stop offending God... He is going to punish the world for its crimes by means of war, of hunger, and of persecution of the Church and of the Holy Father." 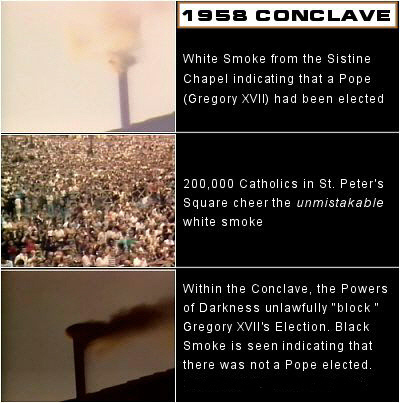 *See the forewarned by Our Lady of Fatima, terrible persecution of the True Catholic Church (2011 A.D.) fully documented here. 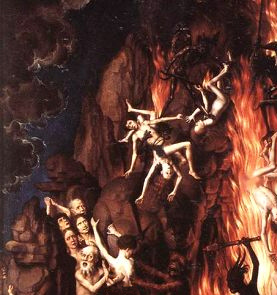 Souls of the Damned in Hell being Tormented by Frightful Demons. immediately after seeing the vision of Hell. "...if [people] do not stop offending God... He is going to punish the world for its crimes by means of war, of hunger, and of persecution of the Church and of the Holy Father." Father [Fuentes], the Blessed Virgin is very sad because no one heeds her message; neither the good nor the bad. 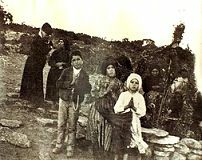 The good continue on with their life of virtue and apostolate, but they do not unite their lives to the message of Fatima. Sinners keep following the road of evil because they do not see the terrible chastisement about to befall them. Believe me, Father, God is going to punish the world and very soon. The chastisement of heaven is imminent. In less than two years, 1960 will be here and the chastisement of heaven Will Come and it will be very great. Tell souls to fear not only the material punishment that will befall us if we do not pray and do penance but most of all the souls who will go to hell." The plotted and successfully carried out, usurpation and subsequent suppression, of a True Holy Father's pontificate for more than 30 years. See the concrete evidence that Cardinal Joseph Siri of Genoa, was elected Pope Gregory XVII in 1958, and then was unlawfully usurped of His rightful Throne. View this imperative evidence by clicking here. “If people do what I tell you, many will be saved, and peace will come. I promise to help at the hour of death with the graces for their salvation, those who on the first Saturday of five consecutive months shall confess and receive Holy Communion, say five decades of the rosary and keep me company for fifteen minutes while meditating on one or more mysteries of the rosary with the intention of making reparation to me,” said the beautiful lady as she began to glide away toward the east. Now the administrator of the town [an evil Freemason] began to turn against the children. He was not a good man. He had no use for religion or the Church. 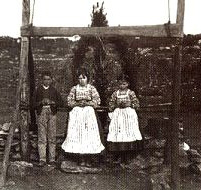 He made the parents of Lucia, Jacinta and Francisco bring them to court. There he tried his best to make them tell him a secret the lady had told each of them when she appeared to them in July. When they would not tell him, he got very angry and sent them away! But on the morning of August 13, Arturo, the Administrator, came to the Marto cottage in a fine carriage. “I want you to ride with me to the miracle,” Arturo said, trying to be pleasant. “We can very easily walk,” Lucia told him. “You must stop at the priest’s house first, and you will be late for the lady unless you ride with me,” Arturo insisted. The children finally accepted the ride, and they all set out for the priest’s house. When they were finished there and were back in the carriage, the Administrator drove off with them to his home instead of to the Cova! Once the ugly man had the children in his own house he told them he would have them boiled in a vat of oil. He called the jailer to take Jacinta first. And after a few minutes he came back and asked who would be next. It was then Francisco’s turn. That left Lucia alone. “I’ll never tell you,” said Lucia. “Away with her!” shouted Arturo. Lucia was shoved into an empty room. 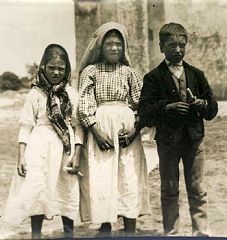 But there, kneeling in prayer, were little Jacinta and Francisco! They had not been boiled as the jailer said they had! On August 15, the children were back home, safe and sound. They had been kept away over the thirteenth so they could not see the lady on that day. But they still believed in her. After Mass on the Sunday following, Lucia, Francisco and his brother John took the sheep out to the pasture. Suddenly Lucia felt the lady was coming. She sent John in haste to get Jacinta. Scarcely had she arrived then the lady appeared. 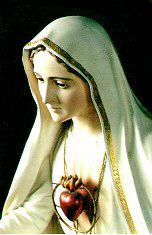 Our Lady of Fatima came to spread Devotion to the Immaculate Heart of Mary. She told us to pray the Rosary everyday and to always wear the Brown Scapular. “Go to the Cova da Iria on the thirteenth of next month. Pray very hard. Make many sacrifices for sinners.” Then the lady was gone. on October 13th, more than twice as many (70,000) would assemble to view a promised miracle. On September 13, more than 30,000 people were crowded into the Cova to see what would happen. Suddenly a white globe was seen moving through the sky toward them. Then a thin white vapor began to form above the little oak, and white flowers began to fall from the clear blue sky. The lady appeared to the children. All saw Lucia’s lips move, but no one heard a word she said! 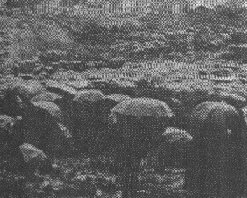 During the late afternoon of October 12, a storm broke over Fatima. Soon all the roads were thick with mud. 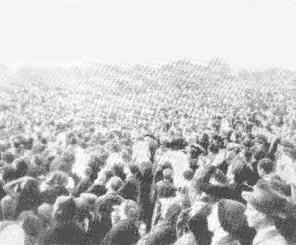 But through it and the heavy rain came 70,000 people to witness the great miracle the lady had promised for that day. When Lucia, Francisco and Jacinta arrived at eleven-thirty, Lucia began the rosary aloud, and all of the others answered her. Exactly at noon, Lucia stopped praying. All saw a white vapor, like incense, form around the children and rise into the wet air. But they could not see the lady. Then all saw the clouds part, and the sun appear like a great disk of white fire. But the children saw a vision of the Holy Family. Next Our Lady appeared as Our Lady of Sorrows, and beside her stood Jesus. He made the sign of the cross over the people. Finally, Our Lady came again as Our Lady of Mount Carmel. She was crowned, and the Infant Jesus stood on her knee. The foretold Miracle of the Sun was witnessed by more than 70,000 people. But while the children were enjoying the three wonderful visions, all of the others were seeing something they would never forget. The sun began to spin around as if it were a piece of fireworks. Then it stopped for a minute or so, only to begin again with more fury. Great streamers of various colors trailed from it. Then it plunged straight at the crowd! Screams arose! Some shouted to Our Lady to save them. Others made acts of contrition out loud. For ten minutes the sun spun and danced. Then it began to ascend once more to its place, and shone brilliantly. The great miracle was over! No one now doubted the appearance of Our Lady of Fatima. Many began, from that day, to live more Christian lives. 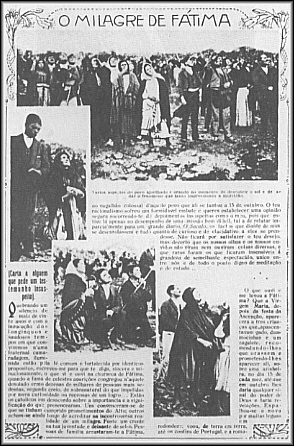 The Story of Our Lady of Fatima. The content of Brother Ernest's book posted on this website, is identical to that of his hardcover book. The historical pictures and captions contained on this website, were inserted by the webmaster and are not included in Brothers Ernest's book. 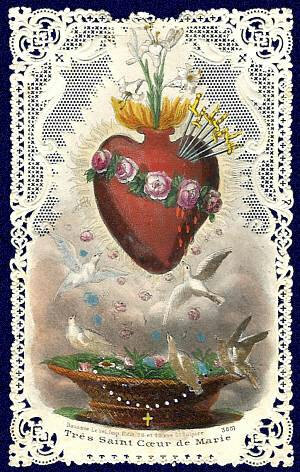 "... in the end my Immaculate Heart will triumph." 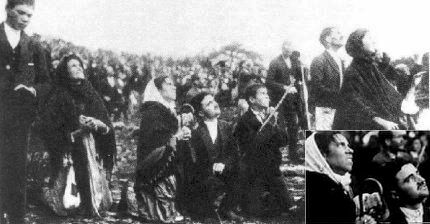 -Our Lady of Fatima 1917 A.D.
"I want to tell you that a chapel is to be built here in my honor. I am the Lady of the Rosary. Continue always to pray the Rosary every day... Do not offend the Lord our God any more, because He is already so much offended." 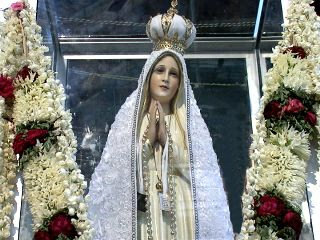 -Our Lady of Fatima 1917 A.D. The second reason is because she said to my cousins as well as to myself that God is giving two last remedies to the world. These are the Holy Rosary and Devotion to the Immaculate Heart of Mary. These are the last two remedies which signify that there will be no others. *"Let all the children of the Catholic Church, who are so very dear to us, hear these words of ours. With a still more ardent zeal for piety, religion and love, let them continue to venerate, invoke and pray to the most Blessed Virgin Mary, Mother of God, conceived without original sin. Let them fly with utter confidence to this most sweet Mother of mercy and grace in all dangers, difficulties, needs, doubts and fears. Under her guidance, under her patronage, under her kindness and protection, nothing is to be feared; nothing is hopeless. Because, while bearing toward us a truly motherly affection and having in her care the work of our salvation, she is solicitous about the whole human race. 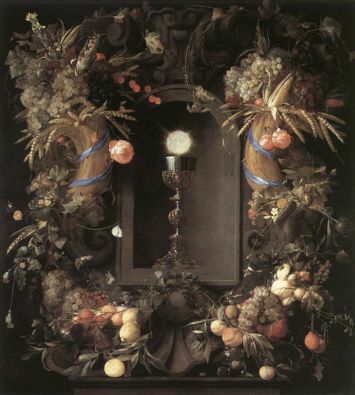 And since she has been appointed by God to be the Queen of heaven and earth, and is exalted above all the choirs of angels and saints, and even stands at the right hand of her only-begotten Son, Jesus Christ our Lord, she presents our petitions in a most efficacious manner. What she asks, she obtains. Her pleas can never be unheard." If you have questions about this website please contact the webmaster, a (True Catholic, who who is in perfect standing with Holy Mother Church, via e-mail at: info@stgemma.com. 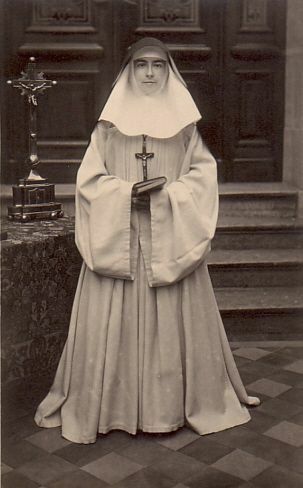 Question: Do you possibly have the greatest gift a Catholic can imagine... a vocation to be a Traditional priest, monk or nun? If possibly so, contact the webmaster who can provide you with futher information/contacts that may be of assistance to you, in this grave matter of discerning God's Will for your soul. Note: In conjuction with StGemma.com Web Productions the Catholic work ("Vocations for the True Church") was inaugurated August 9th, 2005 the Feast Day of St. John Baptist Maria Vianney (commonly known as the Curé of Ars).